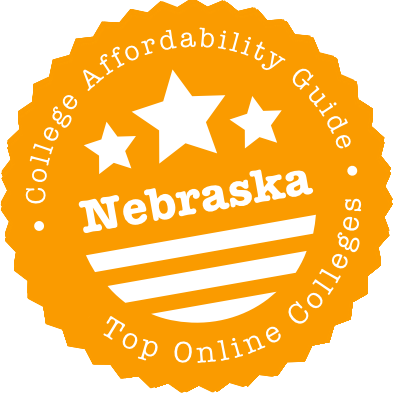 Scroll down to see the top not-for-profit colleges and universities in Nebraska offering online degree programs. Bellevue University offers an extensive list of online degrees, including more than 50 undergraduate degrees and more than two dozen master's programs. Degrees are available in areas including business, management and leadership; science and information technology; health care, nursing and human services; public service, safety, security and intelligence; education and training; human capital; and arts and humanities. Online classes allow students to view the material at any time they want and work at their own pace. The university also offers some online programs in an accelerated cohort format where a group of students progresses through the program together. Students who have at least 60 undergraduate credits can enter an accelerated cohort program and complete their bachelor's degree in 72 weeks. Some master's programs also offer a cohort format. The university offers several starting points throughout the year for online students. Online students have access to 24/7 technical help, the library and other support services. Students can gain undergraduate credit for prior life experiences; they need to enroll in a free online course Bellevue offers in which they will compile a portfolio of experiences that the university will evaluate to determine what credits can be awarded. Metropolitan Community College in Nebraska has about two dozen associate degrees that can be completed entirely online. These programs fall into two general categories - transfer degrees that allow students to complete general studies requirements and start work on a major before transferring to a four-year school, and career degrees. Career degrees are mostly offered in the fields of IT, health information management, and office technology. Most associate programs require about 100 credits and take about two years to complete. Students seeking a quicker route to career skills can take online classes leading to a certificate, with certificate programs offered in most of the fields that also boast an associate degree. The business administration program at Southeast Community College was one of the first programs to offer an all-online option, and it continues to attract many students. SCC has an Associate of Applied Science in Business Administration and several business certificates that are 100-percent online. The business degree is eligible for transfer to four schools that have a 2+2 program, and SCC also has online courses for students who want an Associate of Arts or Associate of Science, which transfer to many schools. SCC has more than a dozen technical or career programs where all the classes can be taken online but students must complete supervised labs, practicums, or clinicals in person. Creighton University offers some 20 online degrees, most at the master's level. Master's degrees are offered in business administration; business intelligence and analytics; educational leadership; emergency medical services; finance; health and wellness coaching; health care ethics; investment management; leadership; negotiation and conflict resolution; medical anthropology; public health; and school counseling. Two programs lead to a bachelor's degree: Leadership and healthy lifestyle management. An interdisciplinary Doctor of Education in Leadership is also available online, and the Master of Arts in Ministry is a hybrid program requiring summer on-campus residency weeks. Most online classes are set up so that students may access the class materials when they want, but they must meet assignment due dates. Some classes require real-time web conferencing. Before starting an online program, Creighton students take an orientation program, and online students have access to library resources, an IT help desk and other aids. The College of Professional Studies at Creighton allows students to earn credit in a variety of ways, including transferring credits from accredited schools, passing standardized exams such as AP or CLEP; getting credit for military training and experience; and getting credit for professional licensing or other credentials. The University of Nebraska in Kearney offers six bachelor's degree completion programs in a fully online format. The programs are designed for students who have completed most or all of their general study requirements already, such as students who earned an associate degree at a community college. Bachelor's degrees are available in business administration, criminal justice, early childhood inclusive education, early childhood and family advocacy, organization and relational communication, and sociology. More than two dozen graduate degrees are available in an online format. The majority of those degrees are in education, including master's degrees in curriculum and instruction, educational administration, and special education. Students can also earn a master's in biology or history online. The MBA program is a hybrid with 85 percent of instruction offered online. Four of the 11 classes require students to attend on-campus meetings, and no class requires more than six on-campus meetings. UNK offers a variety of support services for online students, including a 24/7 technology helpdesk, access to library services, discounts on hardware and software, an online bookstore, and a writing center. The University of Nebraska at Omaha has a flexible online bachelor's degree in general studies that allows students to choose from among 10 areas of concentration, including aviation studies, criminology and criminal justice, fire service management, geography, gerontology, and information technology. The 120-credit-hour program is open to students who are at least 21 or active-duty military personnel and is a good choice for adults who want to complete a degree using prior college credit and other sources of credit. Graduate programs offered online include a master's in critical and creative thinking in six areas of specialty, a master's of public administration in seven areas of specialty, and education master's degrees in special education and school librarian. Some of the programs may have a blended component requiring students to attend a face-to-face meeting, but most classes allow students to log in when they choose. Online students are assigned an academic adviser and can access the library, career services and other college resources. Students who are not Nebraska residents pay out-of-state tuition for online courses. Online programs at Central Community College fall into two categories: transfer or career. Students who want to transfer to a four-year school can earn an Associate of Arts or Associate of Science degree. Individuals who want to gain skills they can use on the job now can pursue an Associate of Applied Science, diploma, or short-term certificate. Most offerings in these online programs are in the fields of business administration, health information management systems, or technology, including quality technology and IT. While students can take all coursework online, they also have access to on-campus services at any of the college's six campuses and centers in central Nebraska. Chadron State offers a variety of bachelor's completion programs and master's programs through its online offerings. The college charges a flat rate for these courses, with Nebraska residents and non-residents paying the same tuition. Students seeking to complete a bachelor's degree in applied sciences in technical occupations can complete their degree completely online and are allowed to transfer up to 70 credits from a community college. Other online degree completion programs include business administration, mathematics, and psychology. Students seeking to complete a degree in education, family and consumer sciences, geoscience, organizational management, or interdisciplinary studies can complete some of the work online. Chadron State offers completely online master's programs including an MBA; Master of Education in Curriculum and Instruction with nine specialties or an M.Ed. in Educational Administration in three focus areas; and a Master of Organizational Management with two focus options. Some online classes are offered in an accelerated eight-week format. The college provides a 24/7 help line for online students and online access to library databases. The University of Nebraska in Lincoln offers a flexible, completely online bachelor's degree completion program, the Bachelor of Applied Science. The program, designed for students interested in agriculture and environmental sciences, is open to students who already have earned at least 32 credit hours at an accredited college or university. The university also offers the totally online Bachelor of Science in Childhood Education in a Mobile Society, which is offered by a consortium of universities offering online programs. The selection of online graduate programs is much broader, including master's degrees in agronomy, applied science, business administration, community development, dietetics, engineering management, interior design, and journalism and mass communications. The university also offers online master's degrees in education with offered specialties ranging from education administration to German language education. UNL also has an online post-graduate L.L.M. in Space, Cyber and Telecommunications Law, the only such program in the country. UNL welcomes transfer students and has a free online tool to help students determine which courses will transfer. Services available to online students includes technical support, programs for veterans and military personnel, an assigned faculty adviser, and on-campus testing centers for online students who must take a proctored test. The School of Professional Studies at Peru State College offers online programs leading to bachelor's and master's degrees in several fields. Students pursuing a bachelor's degree in business administration can choose from a variety of tracks, including accounting, computer and management information systems, marketing, and management. The college also offers a degree completion program in business administration for students who have a technical associate degree or the equivalent. The college also offers online bachelor's programs in criminal justice and psychology. Teachers seeking a Master of Science in Education can choose an online cohort program or a program that lets them proceed at their own pace. The cohort program begins in the summer session and allows students to earn the degree in 19 months by taking eight-week and four-week classes arranged around a full-time teacher's schedule. Peru State also has an online Master of Science in Organizational Management. The college offers credit for life experiences and accomplishments, including credits earned through standardized exams and credits that are granted after a review of an individual portfolio. Online students pay a flat fee per credit hour, with no out-of-state tuition or other fees added on. Northeast Community College is one of the 10 best community colleges in the nation, according to the Aspen Institute, which hands out $1 million in prize money every other year after reviewing more than 1,100 two-year schools. Northeast was honored for its workforce development programs, strong academic advising program, and above-average graduation/transfer rate. Online programs cater both to workforce development and college transfer needs of students. Those pursuing an academic transfer degree work with an adviser to ensure the student takes appropriate classes for transfer. Students seeking career skills can choose from associate degrees, diplomas, or certificates in fields such as business, insurance, and food service. Concordia University Nebraska offers almost three dozen graduate programs that can be completed entirely online. All graduate classes are offered in an eight-week format, and classes are usually in an asynchronous format so that students can fit classwork in around their work and personal schedules. Programs have multiple start dates each year. Graduate business degrees available online include an MBA with an emphasis in accounting, human resource management, finance, leadership and managing teams through change, risk management, business intelligence, marketing, or nonprofit management. Education degrees in curriculum and instruction are available with an emphasis in ESL or instructional technology leadership. Other online education degrees include early childhood education, educational administration, literacy with reading specialist, special education, and teaching English to speakers of other languages. Educators can also earn endorsements in topics such as reading specialist and early childhood special education. Online students can also earn a Master of Health Science, Master of Public Health, or Master of Health Administration. Concordia does not require applicants to its graduate school to submit GRE or GMAT scores, and the school assigns a concierge who helps online students with enrollment. The School of Business and Technology at Wayne State College offers a Bachelor of Science in Business Administration degree that can be pursued entirely online. The program offers a concentration in human resource management. The online Master of Science in Organizational Management degree is offered jointly by Wayne State, Chadron State, and Peru State colleges. The program offers a concentration in sport and recreation management. The School of Education and Counseling offers a Master of Science in Education (MSE) degree that can be pursued 100 percent online. Students can choose to concentrate in one of three areas: PK-8, 7-12, or PK-12. The program meets the standards set by the National Policy Board for Educational Administration (NPBEA) and the Council for Accreditation of Educator Preparation (CAEP). There is also an Education Specialist (Ed.S.) degree available online designed for individuals interested in pursuing a career as a school superintendent. Applicants must hold a master's degree or endorsement in education from an accredited college or university. The college also offers an online Master of Business Administration degree. The program is comprised of 30 credit hours and does not require students to write a thesis in order to graduate from the program. Nebraska Methodist College offers working nurses and others in the health care field a chance to continue their education in a flexible, online environment. All the programs are set up so that a student takes one class at a time, with courses running in a five-week format. Classes are totally asynchronous so working students can access classwork when it fits their schedule. Students who must perform clinical or practicum hours may fulfill this requirement near their home. NMC has three programs allowing registered nurses with an associate degree or diploma to earn a Master of Science in Nursing. Students can complete the nurse educator track in 24 months, the informatics track in about 30 months, and the executive track in about three years. Nurses who already have a Bachelor of Science in Nursing can earn a Master of Science in Nursing in one of three tracks: nurse education, nurse executive, and nursing informatics. The informatics program can be completed in 21 months and the other two can be completed in about two years. Other graduate programs offered online are MBA in Health Care, Master of Science in Wellness and Health Promotion Management, and Ed.D. in Education and Leadership in Health Care. Nebraska schools boast an impressive array of distance learning programs, from community colleges to public universities to private institutions. But where should you look first? We’ll eliminate the noise and take you on a quick tour of the state’s distance education scene. We’ll show you where to search for 100+ degrees in one sitting, how to take courses across state institutions, how to transfer online credits, and where you can get cheap online credits. Then we’ll tell you which schools top our list for both quality and affordability. Your ticket to an online degree in Nebraska is waiting. The University of Nebraska System makes it easy to find online degrees, certificates and endorsement programs at any of its four institutions. Just log on to University of Nebraska Online Worldwide. There, you can search for programs by institution, degree level or field. Click on one of the matching results to see costs, coursework and admissions requirements. If you’re signed in, you can bookmark the page for later or even apply directly for the program. Three colleges make up the Nebraska State College System (NSCS): Chadron State College, Peru State College and Wayne State College. Not only does each one provide distance education, but each also allows its students to take courses from the others via the Joint Enrollment Program. All three colleges charge the same rate for online students, so there are no differences in cost. Wayne State even places online courses from the other two on its own schedule, so don’t hesitate to take the class you need if it’s offered elsewhere. One way to save money on an online degree is by taking your general education credits at a community college, which typically cost several thousand dollars less per year than four-year colleges and universities. Schools within the Nebraska Community College System make it fairly easy to go this route. Five of the six regional community colleges run fully online transfer degrees for just this purpose: Central Community College, Metropolitan Community College, Mid-Plains Community College, Northeast Community College and Southeast Community College. Plus, they’ve gotten together to develop and maintain statewide common courses, so a class at one is equivalent to a class at another. The sixth regional community college, Western Nebraska Community College, offers a number of transferable online courses as well. Just to make sure your transfer degree will get you where you want to go, use Transfer Nebraska. Enter your target school, type in your starting point and click on the courses you’ve taken. The site tells you how the courses should show up on your transcript — as general electives, core electives or core courses. Nebraskan high schoolers can earn credit online in several ways. First, they can take Advanced Placement (AP) courses and score well on the final exam. Doing so satisfies their high school requirements while earning them college credit. Second, they can take dual credit courses that aren’t AP classes. In this case, getting college credit hinges not upon a successful final exam but upon passing the course. Last, they can enroll for college credit that doesn’t count on their high school transcripts. The best place to find and enroll in any of these options is at Nebraska Virtual Instruction Source. Search by semester, subject and/or credit type for the course you want. Institutions from the state’s three higher education systems — University of Nebraska System, Nebraska State College System (NSCS) and Nebraska Community College System — participate. The courses are not free, but they are a lot cheaper than what full-time collegians pay. Nebraska is one of nine member states in the Midwest Student Exchange Program (MSEP). That means residents can go to schools within the other eight for a reduced rate (capped at 150% of in-state tuition). Find participating colleges at the MSEP website. FYI to residents of Illinois, Indiana, Kansas, Michigan, Minnesota, Missouri, North Dakota and Wisconsin: That deal works both ways. Nebraska’s participants include Central Community College, Chadron State, Wayne State and each of the University of Nebraska campuses. We ran all of Nebraska’s schools through our algorithm, and a bunch came back. The schools below all met our standards for quality, flexibility, cost, and use of financial aid. Deciding between several? College Scorecard can give you more data, like how they compare for graduation rates and student debt loads. Northeast Online has a full list of its online degrees & programs. When it comes to tuition & fees, it pays to be local! Nebraska residents and students who live in Iowa and South Dakota get a significant tuition discount. Northeast also doesn’t charge more for online classes vs. campus classes. The financial aid section has a searchable catalog of scholarships. If you’re thinking of transferring your online credits to a bachelor’s degree, be sure to look through the Transfer Guide. Northeast has relationships with many Nebraska universities. Peru State Online has many advantages. Tuition is a flat rate for all students, resident or non-resident, and the school doesn’t tack fees on top. You can take classes in a 16-week or eight-week format, depending on how fast you want to finish. For faster delivery of that online degree, take summer courses. Finally, you can take classes for credit across the Nebraska State College System. Ready to apply? That’s free. Start working on the financial aid applications while you wait for the acceptance letter. The UNO distance education page lists the school’s online degrees and certificates, including its highly regarded Criminal Justice and bachelor’s programs. However, we recommend using the University of Nebraska Online Worldwide portal, as it does a better job of laying out costs, curriculum and admissions protocols for each degree. Tuition and fees for distance education at UNO differ for residents and nonresidents, but both rates are reasonable. Plus, financial aid can only reduce your bill. For instance, you can qualify for Collegebound Nebraska assistance if you are Pell Grant eligible. The University of Nebraska’s flagship campus, UNL, receives plaudits in U.S. News & World Report’s rankings for its online MBA, graduate education and graduate engineering programs, not to mention its bachelor’s programs in general. Get details on each at the Office of Online & Distance Education. Ready to apply…just as soon as you finish high school? You don’t have to wait. The NEBRASKA Now program lets you earn college credits online for just $250 per class (read: not per credit!). Go ahead and compare that to the standard costs. You can’t beat it. Another school in the Nebraska State College System, Wayne State, also makes our list. Like Chadron State and Peru State, it uses a standard online rate for residents and nonresidents and eschews hidden fees. Although that rate is a very competitive starting point, the Student Financial Services office makes it its mission to lower your costs through grants, scholarships and loans. How about the actual academics? You can see its online graduate programs as well as online undergraduate courses at the Distance & Continuing Education Office. The Higher Learning Commission (HLC) is the regional accreditor for the Cornhusker State’s degree-granting postsecondary institutions. Look for your school on its list of Nebraska institutions. If you see a “Public Disclosure Notice,” that’s potentially bad news because it can indicate HLC has taken a negative action against a school. A notice is a warning, probation is more serious, and show-cause means the school may lose its accreditation. If your school is not on HLC’s radar, check the Council for Higher Education Accreditation’s (CHEA) database because it may be under a different accreditor. Note: Students at schools with national accreditors, as opposed to regional ones, still have access to financial aid but typically have limited credit transfer options. Although we didn’t find any schools in Nebraska with accreditation or regulatory troubles, it’s important to thoroughly research your chosen college’s reputation before applying. One of the most essential ways to do that is by checking the accreditor’s website. Higher Learning Commission (HLC): HLC is the regional accreditor for Nebraska’s colleges and universities. Make sure your school is accredited and has no negative actions against it. Midwest Student Exchange Program (MSEP): With MSEP, Nebraskans get reduced tuition at schools throughout the Midwest, just as Midwesterners get reduced tuition at select Nebraska colleges. Nebraska Community College (NCC) System: The site links to the regional community colleges and also explains NCC statewide courses — those classes that are the same across institutions and typically transfer to baccalaureate-granting institutions. Nebraska State College System (NSCS): NSCS is composed of Chadron State College, Peru State College and Wayne State College, all of which run online courses. Look into the Joint Enrollment Program to see how students at any one can easily take online courses at the other two. Transfer Nebraska: Type where you’re going and see whether courses you’ve already taken meet graduation requirements. Nebraska Virtual Instruction Source: This is an excellent resource for secondary schoolers hoping to get a jump on college. View and sign up for Advanced Placement courses, dual credit and/or college credit from some of the state’s premier postsecondary institutions. University of Nebraska Online Worldwide: Search for online degree from UNK, UNL, UNO and UNMC all in one place. The website is loaded with details on each course of study and even lets you apply directly.